Back in 2011 I featured a world tour video project called Flake and Flames, by a motorcyclist named Jesper Bram. Bram is famous among motorcycle bloggers as the owner of Helmet Hair Motorcycle blog. Helmet Hair was once the coolest motorcycle blog on the internet, so I knew that Jesper's movie would be equally if not exponentially more awesome. Motorcyclists live a lifestyle far from the mainstream. We don’t hold the same set of values as everyone else. We don’t comply with society’s prescribed notions of acceptable norms and behaviours. In a world of cages, rules, and safety nets, we find ourselves a counter-culture all of our own. Whether we sweat in the dirt, shave seconds off at the track, stroll the boulevards, or spend hours in the shop creating a machine like no other, we’re all part of riding and her many subcultures. 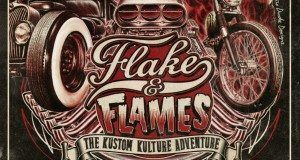 A new documentary film, Flake and Flames, looks at the Kustom Kulture, one of our most colorful. The film looks at top artists and designers from around the world, and some of the hottest rides.